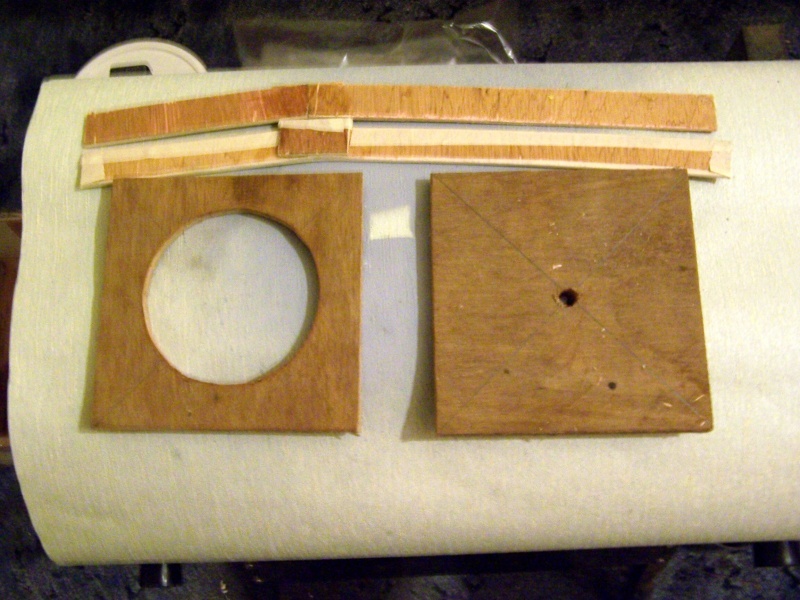 Once the sides are removed I gently pull the moulds free of the patterns. Another view of mould and pattern. 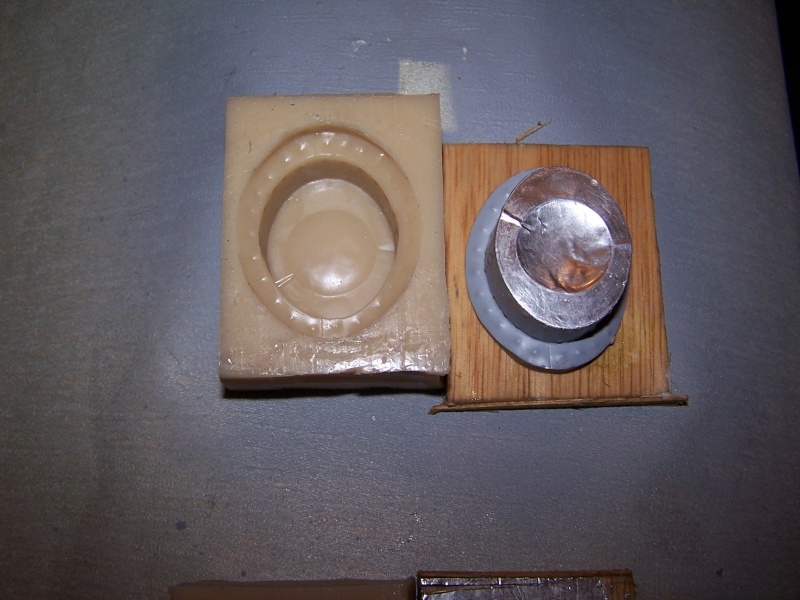 Do you use Vinamould because you can extract from the mould? (I imagine it has some give?) 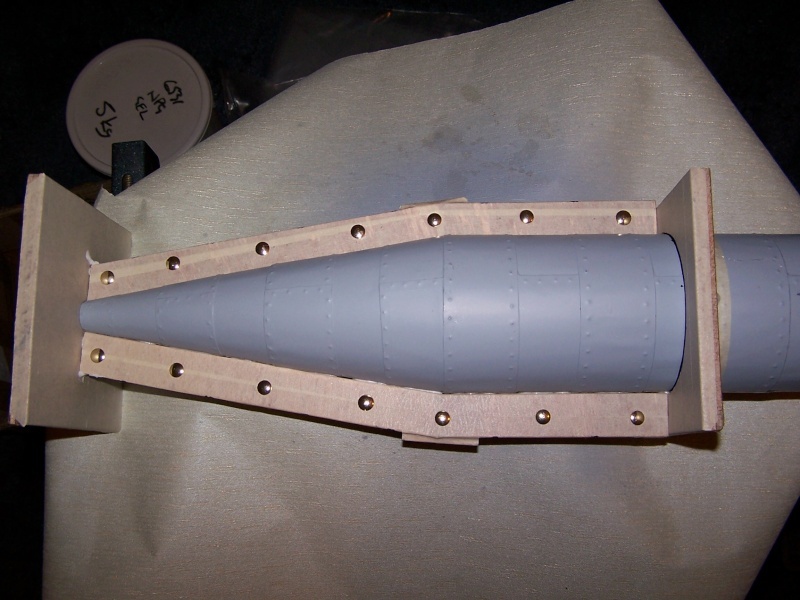 Can you make multiple casts from Vinamould? 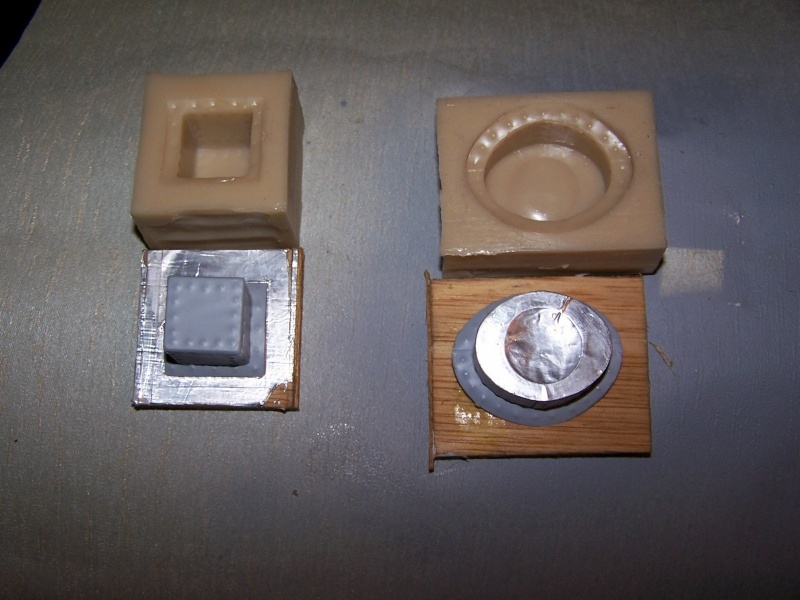 Vinamould is very flexible, normally I would make a hard mould for these type of parts but the rivet detail would cause problems extracting the parts, so it would need to be a two part mould. 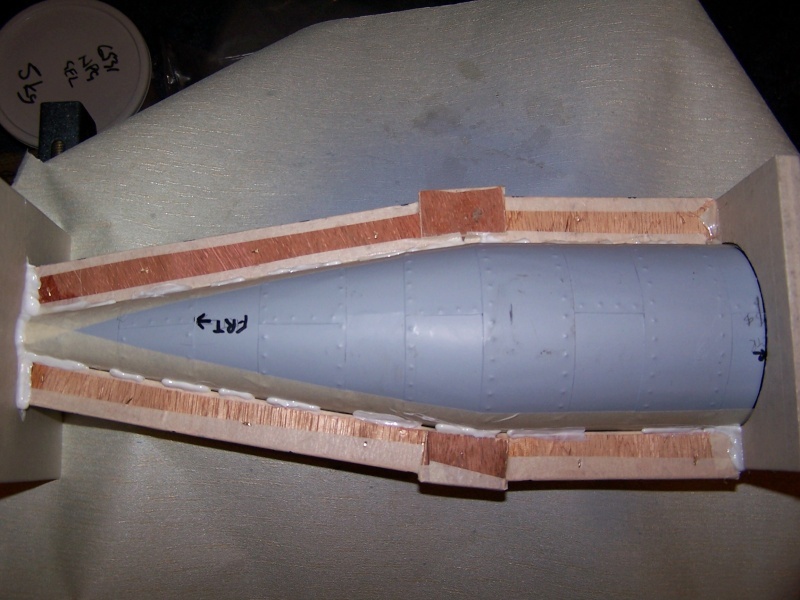 Also with vinamould you do not need any release agent, and it copes with quite large undercuts, the down side is that the flexiblity becomes a problem on larger components, so I tend to use hard moulds when possible on large parts such as the main hull. 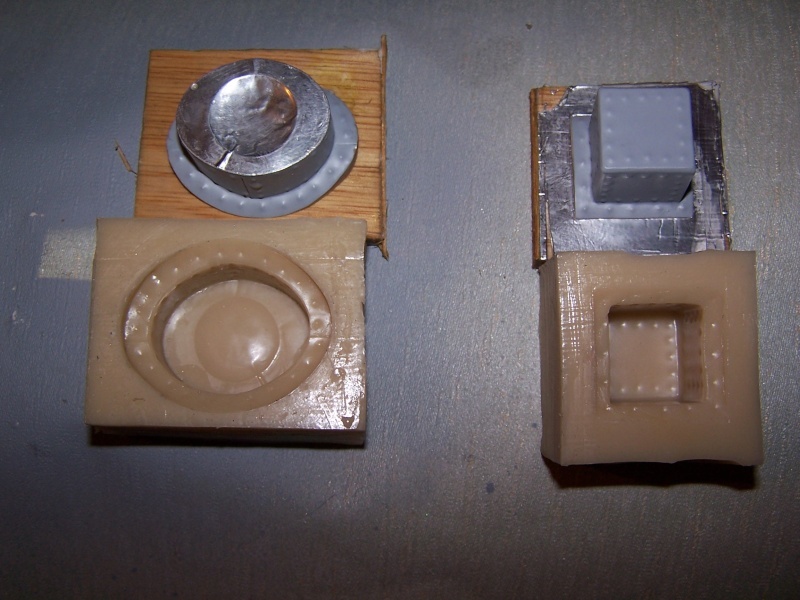 I would expect to get around forty parts from these vinamould moulds, another thing with this product is it is totally re-useable, so you can re-make the mould anytime you need to. It sounds really good stuff. Where do you get it from? SPONSORED BY VINAMOULD - YOU KNOW IT MAKES SENSE! 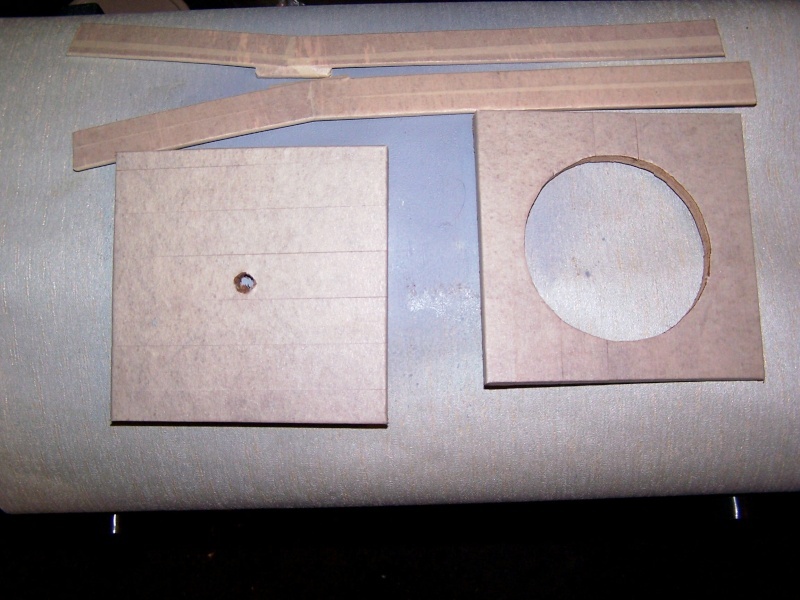 The shuttering for the main hull, ends are 3/8" ply, the seperators are 1/8" ply and follow the shape of the hull as near as possible. 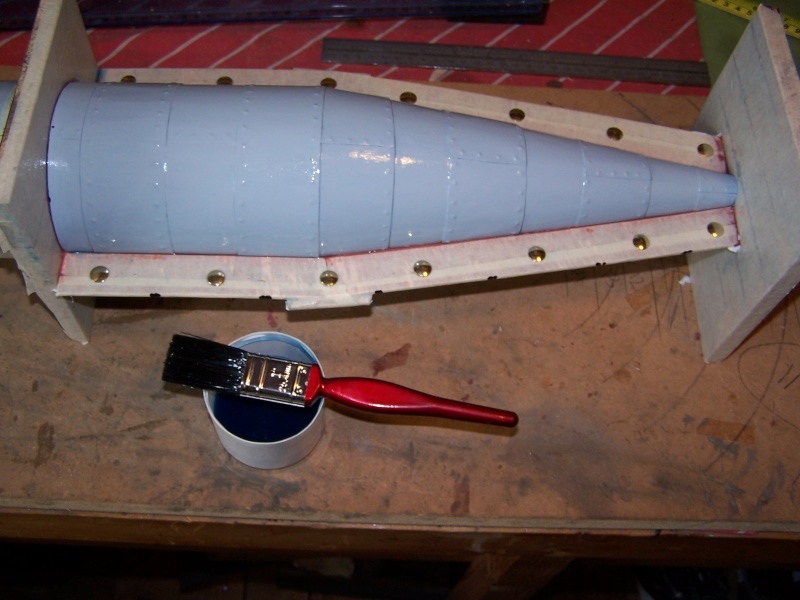 The parts covered with masking tape, this will help stop the gel coat from sticking to the timber, the tape is wrapped around the edges that are in contact with the hull. 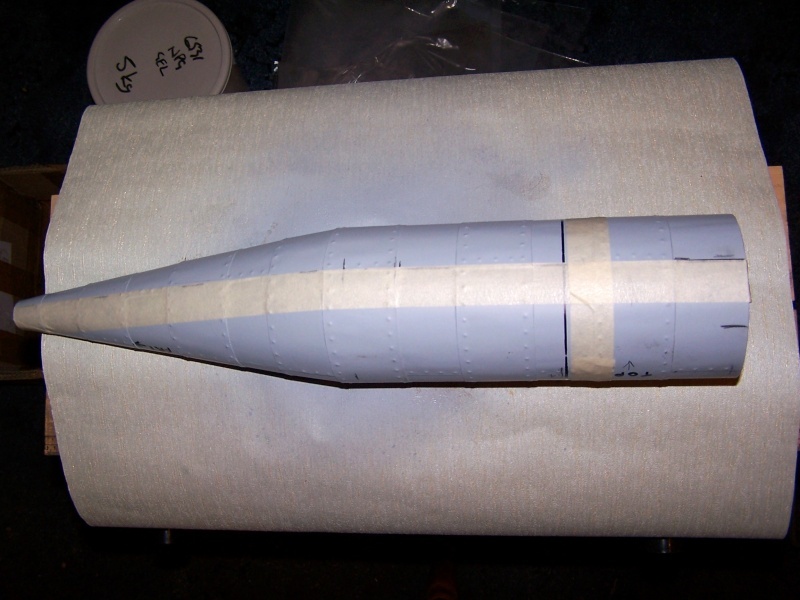 The seperators covered in tape with drawing pins nailed in at regular spaces, these will become the locator's for the two halves of the mould. 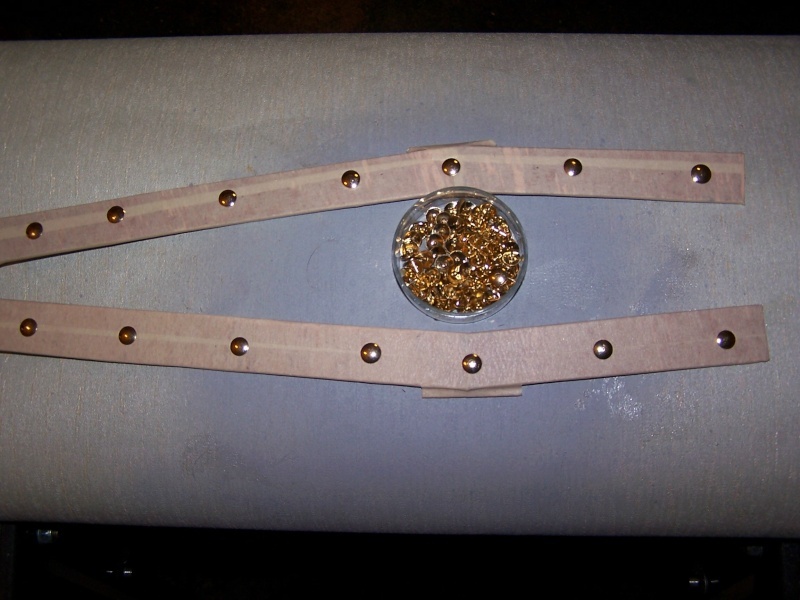 It is essential to make sure that the pins are nailed down tight. 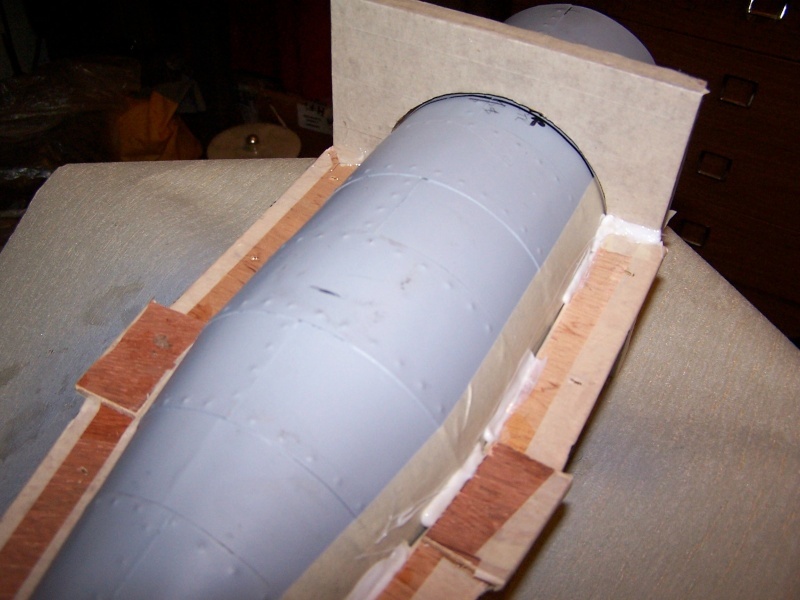 The hull taped up along the centre line, it is most important that it is exactly on the centre, although in this case I have had to compromise to avoid some of the rivet detail, this will make it more difficult to remove the hull from the mould. The underside of the shuttering atached to the hull, it's held in place with glue from a hot glue gun, it is glued along the edge of the tape insuring that the edge of the tape is just covered by the seperators, as you can see the glue is only on the tape. 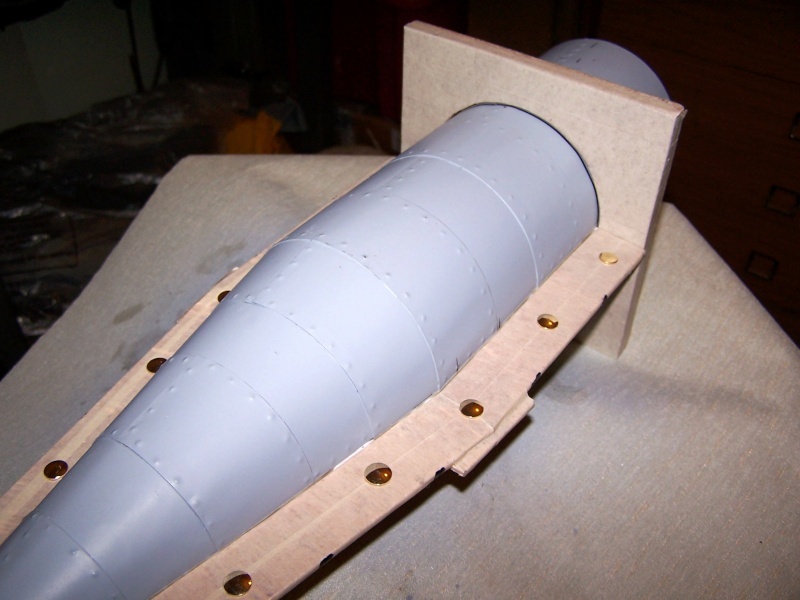 Another view of the underside. 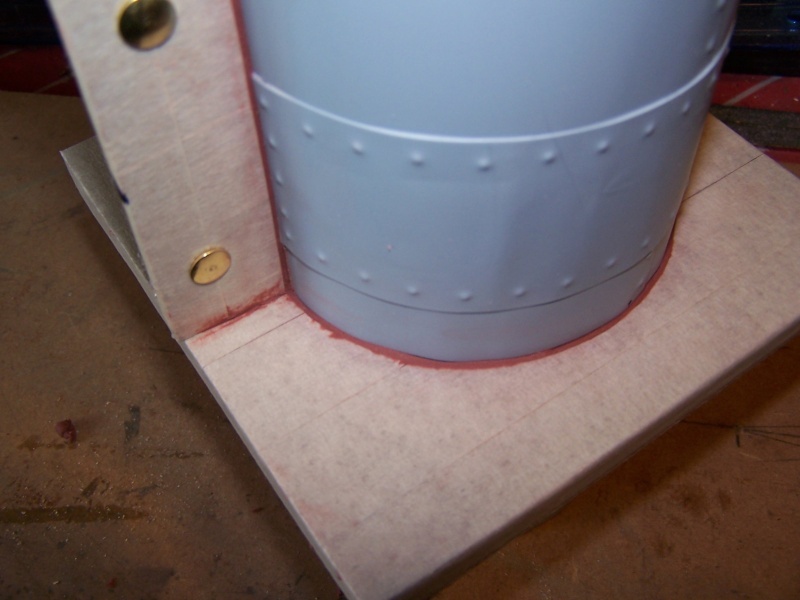 A view of the top, as you can see there are small gaps between the hull and the shuttering, these must be filled to insure that the gel coat does not creep underneath the shuttering. It is coming on really well, Nigel. Couple of things I don't understand. -The hull is no longer bare tin - what is it covered with now? -I don't quite follow the drawing pins but I take it they will form "location dimples" - for want of a better phrase! 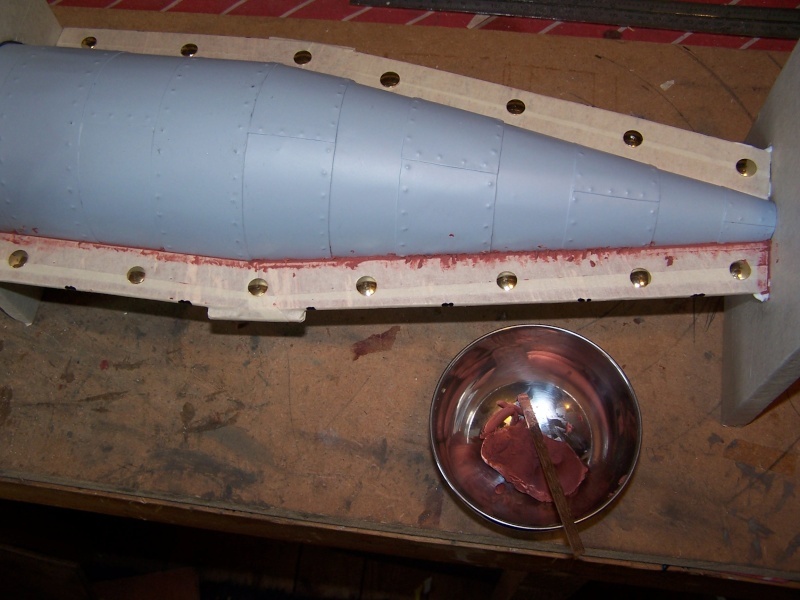 The hull is painted in etch primmer,to prevent rusting, and yes the drawing pins are locators. The seperator's need to be on the centre line(widest point of hull)think about it...and you tell me why David !! 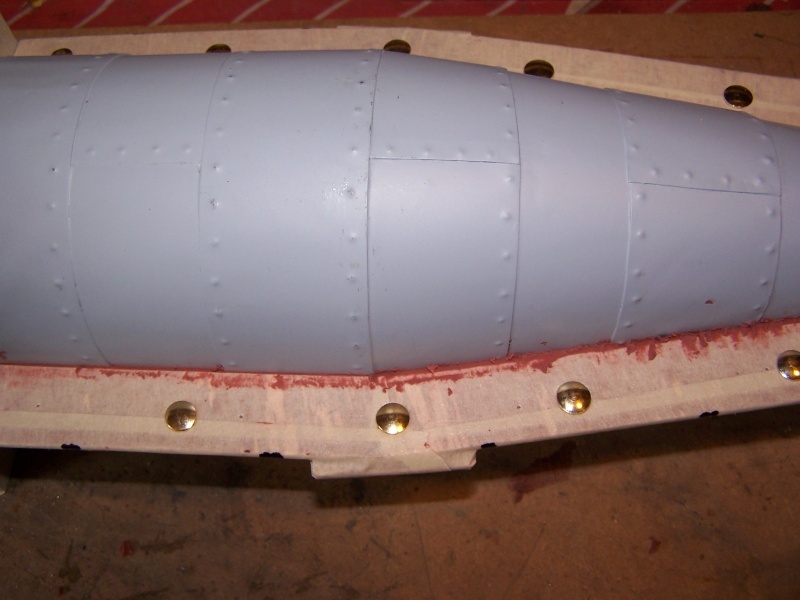 There will be no trimming to do, the two halves will be bonded together whilst sill in the mould, this will form the pressure hull, all will become clear. The gaps are now sealed with plastacine, I use a lolly stick sharpened like a chisel, dont worry about it looking messy at this stage. Another view showing the pastacine and the lolly stick. The plastacine cleaned up using the lolly stick dipped in white spirit, use it like a chisel and remove excess plastacine until flush with the seperators. 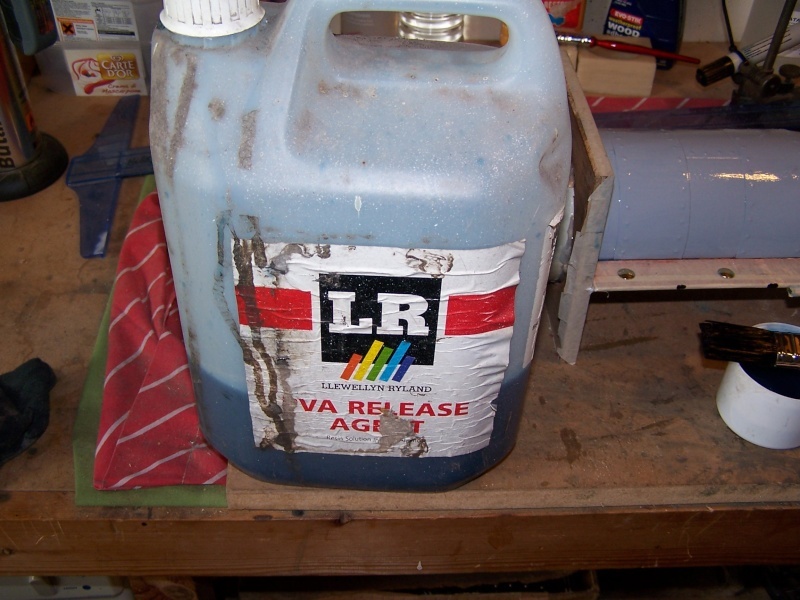 I then clean the surfaces with soapy water carefully, ready to apply a PVA release agent as shown. 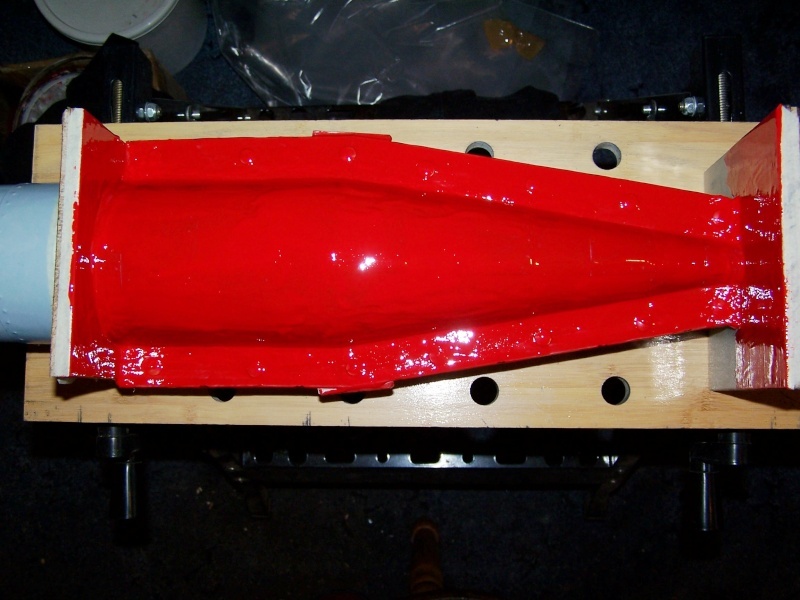 I always apply 2 coats of pva,I put the first one on very thick and sloppy and then wipe it of with a lint free cloth,this leaves a very thin film of PVA on the mould,allow it to dry for about an hour, then apply another coat as if you where painting a door,smooth strokes of the brush and insure that there are no runs,what you see at this stage will come out on the mould. 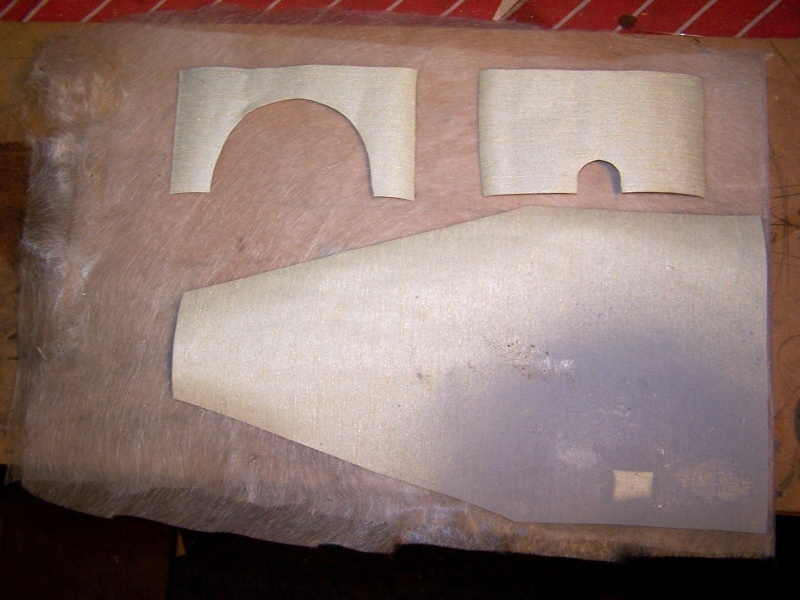 Allow the Pva to dry for a good couple of hours,I now cut pattens for the fibreglass mat and pre cut all the mat for the mould,in this case each half mould will have, 1 tissue,1 300 grm,and 4 400 grm layers,this photo shows the pattens sitting on top of the tissue. I now mix and apply a layer of gel coat,this is bassically a thick resin I have added color to to the gel which is normally clear,always add the color before you add the activator,I cannot give you the mix ratio of gel to acctivator as this varies with each manufacturer,so allways ask for a product information sheet,another couple of points to think about at this stage,gel and resin generate heat when activated this is a serious fire hazzard, never add more activator than is recomended to either gel or resin,try to mix only as much as you need in one go,if you have acctivated gel or resin left in the mixing pot place it in a buckett of water or it will catch fire,one more point at this stage as daft as it sounds never make the mould the same color as the product,you cant tell where you have put gel on and where you haven't,belive me I have seen it done.